Fast and flat and featuring a running finish along this coastal Virginia city’s beachfront boardwalk, the Rock ‘n’ Roll Virginia Beach Half Marathon is one of the country’s most popular races of its kind, typically drawing a field of more than 10,000 runners every year for its annual Labor Day weekend running. While they’re out on the course, runners encounter local bands playing from stages set up throughout the race, from the starting line on 14th Street and Pacific Avenue all the way down to Camp Pendleton and out to the Oceanfront Boardwalk, where the finish line lies. Largely because it’s run along a coastal route, this point-to-point is mostly fast and flat, from the starting line all the way through the middle of the course to the finish. From the starting line at 14th Street and Pacific Avenue, the race takes runners straight up Pacific Avenue, where runners head north for a long straightaway within just a couple blocks of the nearby beach. At the turnaround point, runners turn right onto Atlantic Avenue, even closer to the beach, and continue south. This portion of the race course follows Atlantic Avenue as it turns into General Booth Boulevard, which runners follow southward all the way down to the Camp Pendleton military base. After making the turn at Prosperity Road and heading back northward along Prosperity toward Birdneck Road — and past the trees and green fairways of Red Wing Lake Golf Course on the right — runners follow the course as its winds through several twists and turns through the base, exiting back onto General Booth Boulevard for the run back north toward the beach. Runners follow this stretch of the course all the way up to the intersection with 14th Street, passing by the waters of Virginia Beach’s Lake Rudee and Lake Holly on the left along the way. The course turns quickly onto 14th and then proceeds for just one block before turning right again onto Atlantic Avenue. Runners follow it until it dead ends near the Rudee Inlet and turns around again, and then heads along the boardwalk for the final stretch toward the finish line, where race organizers add there will be plenty of beer and other refreshments awaiting the runners. Set along the Atlantic coastline in the southeast corner of the state, about a two-hour drive from Richmond, the city of Virginia Beach typically sees September temperatures between 65°F and 80°F, while also seeing some of its heaviest rainfall of the year. On race day (Sept. 1), the average low is 68°F and the average high is 83°F. See the race route map for the Rock ‘n’ Roll Virginia Beach Half Marathon here. To reserve your spot in the late summer 2019 running of the Rock ‘n’ Roll Virginia Beach Half Marathon, 1-Mile or 5K race, register online at the event website here. 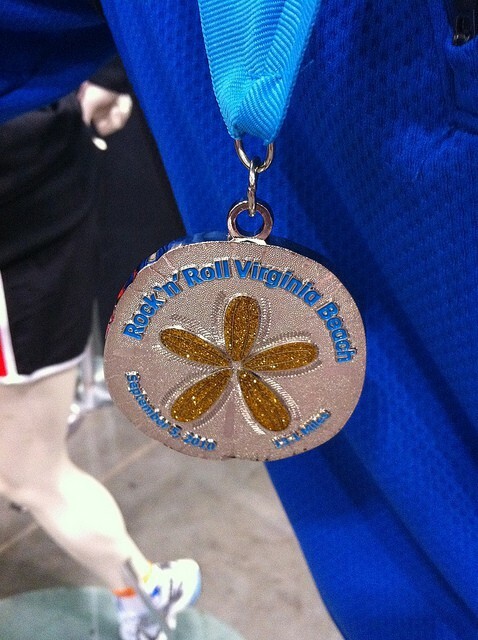 Ever run in the Rock ‘n’ Roll Virginia Beach Half Marathon? Share your impressions here, or post your review in the Comments below. I work for fort lee and I was wondering if you would like to work with us and do some advertising with us. Iran in the Virginia Beach Rock & Roll half marathon 2018. My bib number was 6786. I have not gotten any info on photos from the race. Please advise. We would love to host a registration site for your marathons in Virginia Beach. We would be willing to throw in swag in registration bags and donate some prizes. Please let me know if you are interested and we can set this up. Is the actual run starting at 7 AM or is everyone’s just getting together at that time? Thanks! I need someone to contact me regarding a shipment from the Philadlephia marathon that was recieved at the Expo. We are not attending the Expo and need to connect with your decorator to have our items shipped back to us. Please contact me at 215-683-2072. Thank you much! I would like to receive information about the 2016 marathon.